Home » News and Stuff » Uncategorized » Awesomest Day! Earlier in the year, I was honoured to have The Great Chocoplot selected as Worcestershire’s Awesomest Book! How awesome is that??!! The award scheme was to encourage children in the area to read, discuss and vote on their favourite books. 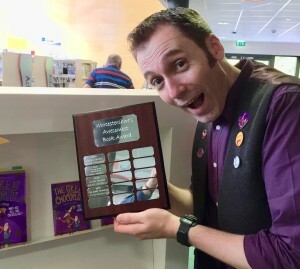 I didn’t get to the actual award ceremony, so it was amazing to finally get my hands on the trophy itself (previously won by Rachel Hamilton and a certain David Walliams! ), when I visited Alvechurch Library. I had been invited to hand out medals and certificates to all the dedicated readers who had completed the Summer Reading Challenge. It was such a pleasure to meet so many keen readers and the librarians, and volunteers, who work so hard to generate a real love and enjoyment for reading in this area. It was a privilege. Thank you to all involved. ← WARNING: The Chocopocalypse has arrived in the US!